Improves equipment life and performance by removing at least 90% of all dissolved solids tht cause scale build-up. Protects againsst taste and odor causing contaminants while removing dirt particles and dissolved minerals. 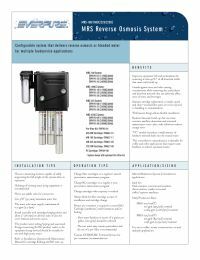 CC model includes calcite feeder cartridge which adds minerals back in the water. Reverse Osmosis Hold Tank is not included with this system. Click here to select an RO holding tank.